These are addictive. So incredibly addictive. I made them one weekend afternoon and it took all of my strength not to eat all of them before our guests arrived that night. I served them with a cheddar cheese sauce that I'm not sharing here because we found it less than impressive, but there are plenty of recipe options floating around the internet if that excites you! 1. In the bowl of a stand mixer fitted with the paddle attachment, mix together the water, sugar, yeast, and salt on low speed for 10 seconds. Switch to the dough hook and add the flour and butter. Mix on low speed until well combined. Change to medium speed and knead until the dough is smooth and pulls away from the side of the bowl, approximately 4 to 5 minutes. Remove the dough from the bowl and transfer it to a well-oiled bowl. Cover the bowl tightly with plastic wrap and set it in a warm place for approximately 50 to 55 minutes or until the dough has doubled in size. 2. Preheat the oven to 425 degrees F. Line 2 large baking sheets with parchment paper. Set aside. 3. Bring the 10 cups of water and the baking soda to a rolling boil in an wide 8-quart saucepan or roasting pan. 4. In the meantime, turn the dough out onto a slightly oiled work surface and divide into 8 equal pieces. Roll out each piece of dough into a 24-inch rope. Slice each rope into 1-inch pieces. Place a lightly damp towel over the pretzel pieces to prevent them from drying out while you roll and cut the other pieces. 5. Using a slotted spoon lower a handful of the pretzel pieces into the boiling water and boil them for 30 seconds, flipping them around in the water with the spoon a couple of times. Remove the pretzel pieces from the water using the spoon, drain as best you can, and place them on the baking sheets. 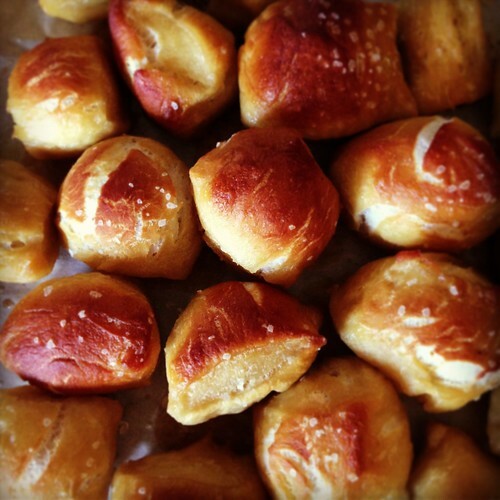 Brush the top of each pretzel with the melted butter and sprinkle with the pretzel/Kosher salt. Bake until dark golden brown in color, approximately 10 – 12 minutes. Brush with remaining melted butter before serving. Serve warm.